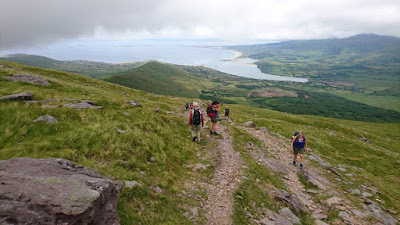 On Sunday July 8th the club outing was to Mount Brandon in the Dingle Peninsula. 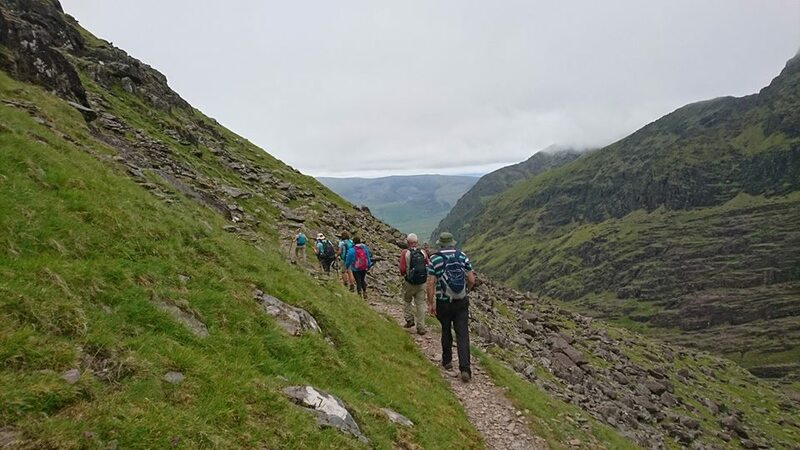 At 952 meters this mountain is just 86 meters shy of Carrauntoohil. It is a formidable mountain and it dominates the peninsula. Rising up from sea level to its majestic summit. Leaving town at 08.00 on a bright morning, we had high hopes that we would have cloudless views from the summit. The mountain is notorious for its cloud covered head. We had reports that the summit had been clear all week. We stopped at a filling station in Blenerville for coffee / tea and to meet up with members who had travelled from other areas. A few kilometers outside Tralee we met some light rain. Imagine in Ireland it was a talking point in the car....we had actually seen some rain..the sky darkened. After some time the sky brightened again. 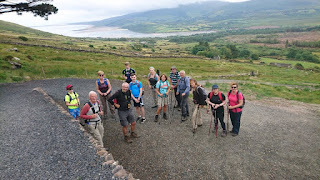 Passing through Cloghane we turned left up to our starting point at Faha. Here we got lucky as we found enough room to park in the small car park. Changing into our gear we could see that the summit was covered in fog. Undeterred we made our way. The last time the club did this mountain we took the Saints Road from Baile Breic. This was for some of us a new route. The path is well way marked with yellow arrows painted on the rocks and white posts. It is a well trodden route, no navigation skills ( or Taxis ) are required. After leaving the car park you come to a beautifully maintained grotto. Erected as a result of a pilgrim climb in the Marion year of 1952. 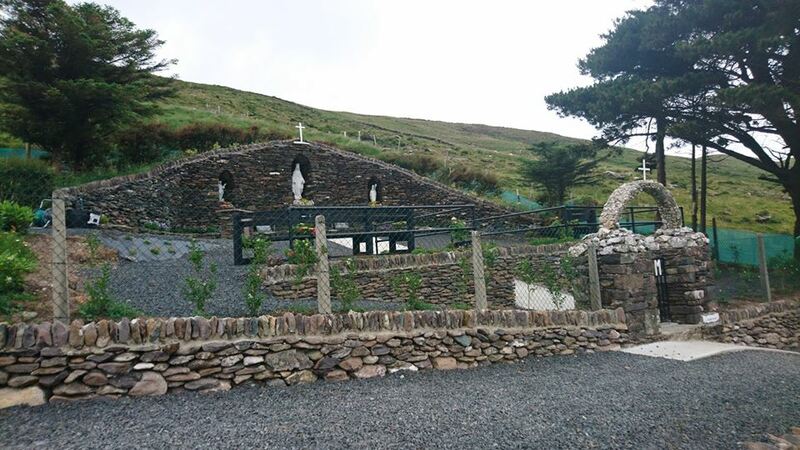 A Tralee man John O Connor who took part, was inspired to create a grotto. With the help of local young men and women from Cloghane and surrounding areas, his dream eventually came to fruition. He cycled the 50 mile round trip from Tralee each Sunday to supervise the building. ...... A different era. The route continues along a gentle slope until it reaches a large glaciated valley surrounded by towering cliffs.The valley floor is punctuated with a series of small lakes. The views over the Dingle Peninsula are awesome and the village of Cloghane lay below us in the distance. Reaching the top of the valley we crossed the stream, we could see a rocky eroded path rising up to our left. This would bring us onto a col, turning left it’s only another 150 meters to the summit. The short climb to the col is the most difficult part of the treck. Care must be exercised here. The fog had not cleared when we reached the top... This is a sacred place and in pagan times the festival of Lughnasa was celebrated here... Saint Brendan built a small oratory here and spent 40 days meditating before his voyage to the New World...... I think he would have second thoughts about going there now..
Barr an Turas is how the summit is known locally in the Irish language. Meaning “ top of the journey”. It refers to Mount Brandon being the ultimate destination for the pilgrim. Reaching the top of Brandon is no mean achievement. Well done to all involved. We also learned at the summit that some lady’s (Phil ) ashes are interred near the Cross on top. Apparently she loved to climb Brandon. RIP. Retracing our steps we had lunch in a shady spot before we began our decent to the valley. Reaching the car park we changed. It was decided to go to Thomasins bar for some welcome refreshments. The food was good here and everyone one seemed to enjoy it. in front of the other.....again and again and again.